Starting today, you can watch the health of all the components of your cloud application on a single Application Map – even if they’re written in different languages or as serverless functions. Smart Detection notifies you of performance issues and helps you identify the causes. You can trace specific client requests through your whole system. You can debug execution snapshots of problematic operations, complete with variable and parameter values. 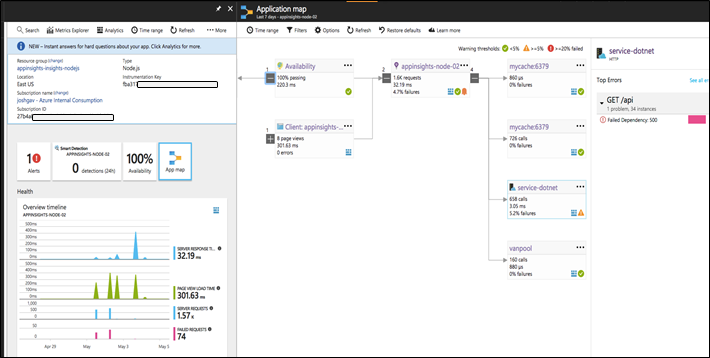 Azure Application Insights offers the best monitoring solution for cloud applications, helping you to find and fix issues rapidly. In addition, we now offer enhanced usage analysis tools to help you improve your app’s usability. Snapshot debugger and profiler show you execution traces from your live web app where customers encountered problems (and a few, for comparison, where they didn’t). No more hours trying to reproduce a rare failure or performance issue, and much faster fixes! 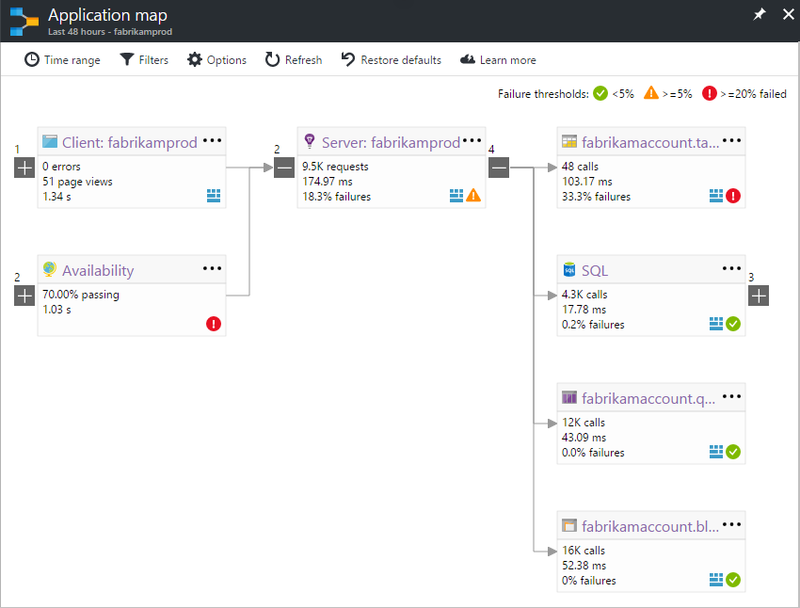 Application Map now shows all the dependent roles and components of your application on one active diagram – including clients, web services, backend services, Azure Functions, Service Fabric, Kubernetes. Every node shows its performance and has click-through to diagnostics. Smart Detection helps you quickly identify the root causes of performance anomalies. Usage and retention analysis tools help you discover what users do with your app, so that you can measure the success of each feature and improve its popularity in each iteration. If Application Insights is new to you and you develop web apps in ASP.NET, Node.JS, or Java, why not give it a try - it’s easy to get started and free for experimental volumes of use. And it works for apps run on your servers or in any host environment (although some of today’s updates are for apps that run in Azure). 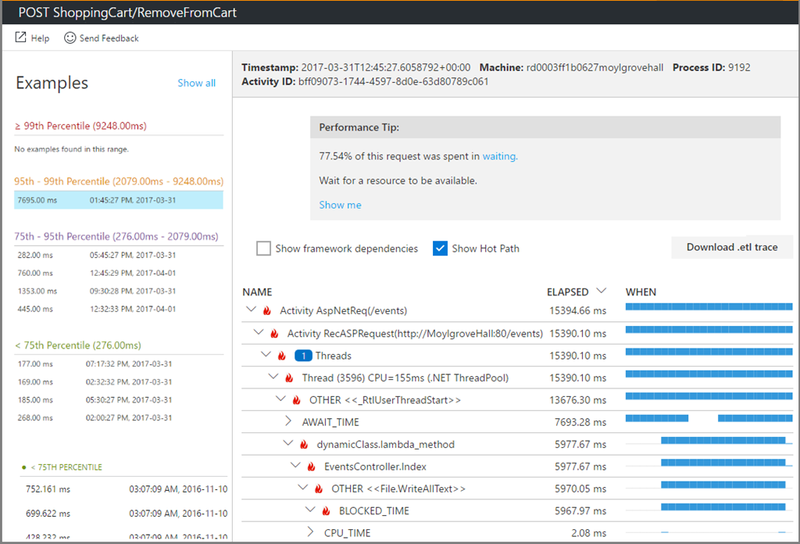 Snapshot Debugger and Application Insights Profiler are for live debugging and profiling in the Cloud. By working on web request instances that showed problems in the live app, you avoid having to replicate the problem on your test machines. Snapshot Debugger, in preview, uses telemetry to capture debug snapshots at the point exceptions are thrown in your application. 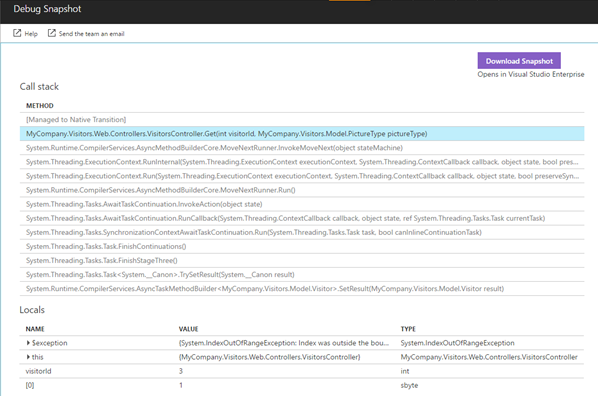 You can view snapshots in the portal to see variables and parameters, or open them with Visual Studio Enterprise for a full snapshot debugging experience. The Application Insights Profiler, now generally available for Azure App Services, automatically collects sample profiles of your code running in production and allows you to see code level breakdowns of where time is spent when executing requests. Preview support is also available for virtual machines, VM scale sets and Cloud services. Using the Node.js SDK improvements, you can select Node.js as option in resource creation blade, and collect common Node.js dependencies such as MongoDB, Redis, MySQL, and common Node.js logging solutions. You can also leverage the preview support of Application Insights SDK for .NET Core running in Kubernetes and get the related properties into Application Map and analytics. 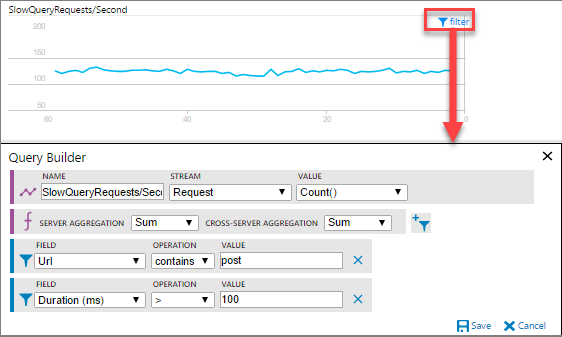 Azure Functions and Service Fabric provide direct integrations to Application Insights, in preview, making it easy to get rich monitoring and in-depth analytics. Which features of your app are most popular? How often do users return to your site? Is your latest enhancement helping users or making it more difficult for them? To help answer questions like these, Application Insights has new usage analysis tools, now in preview, to empower you to better understand how customers use your web apps. Using the segmentation tools, you can investigate how many people are using a feature, see trends in that usage, and even go deeper to see whether different subgroups of users have similar or different behavior patterns. Similarly, if you have been wondering how many users come back after first engaging with your web app, the retention analysis tool lets you see patterns of engagement between two actions. Although you can apply these tools to the standard page view telemetry, the most effective knowledge is gained when you insert a few lines of code to record key business events or user actions, such as opening an account or completing a purchase. You and your team can use this data to make educated and informed decisions about feature investment and prioritization to help you achieve your business goals. You can now select and filter the metrics and events that you see in Live Metrics Stream. Live Metrics Stream is the near-instant live feed of key metrics which is extremely useful for monitoring live updates and on-the-spot diagnosis. Now you can use it to easily monitor in real time any custom KPI or Windows performance counters. With native integration of Application Insights to Azure Monitor, you can bridge the gap between your app and infrastructure, making it easier to diagnose and fix app issues related to infrastructure. You can now use an Application Insights metric as the source for an Autoscale setting, including new configuration UX and troubleshooting improvements, helping your apps perform the best even when their demands change. Moreover, the Azure resource health and alert information that helps you diagnose and get support when an Azure issue impacts your application, is now available as part of the Application Map along with the dependency KPI. The application map can now show data coming from multiple applications and roles within an application. I encourage you to take advantage of these capabilities in Application Insights to improve your DevOps experience and drive business impact. Stay tuned on the Application Insights tagged blog posts and learn more about our continued innovation to help you be successful.